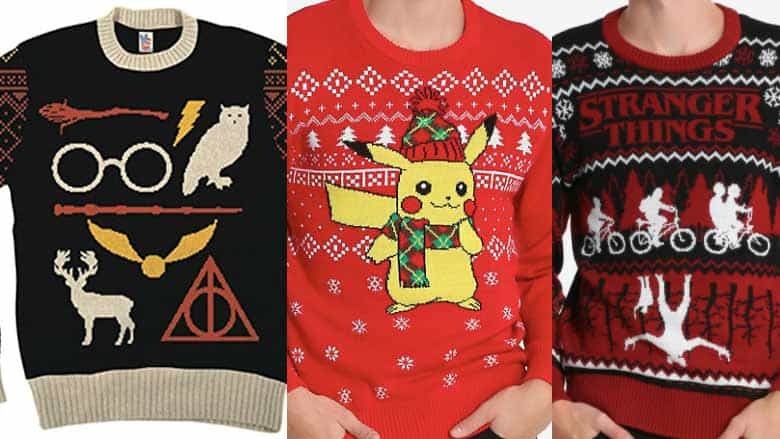 31 Nerdy Ugly Christmas Sweaters: The Ultimate List (2019) | Nerd Much? As Halloween comes and passes, it’s time to focus on the next major holiday, Christmas. From the hordes of shoppers on Black Friday to the wonderful deals online, the holiday season is quickly approaching. 2018 is a great year for nerds, especially with all of the new major releases from movies to video games. Over the past few years, the ugly Christmas sweater trend has exploded, featuring cable knit tops and knitted designs that are always the talk of the party. But for us nerds especially, new options have popped up in various depths of the internet that combine our numerous fandoms and the holiday spirit. 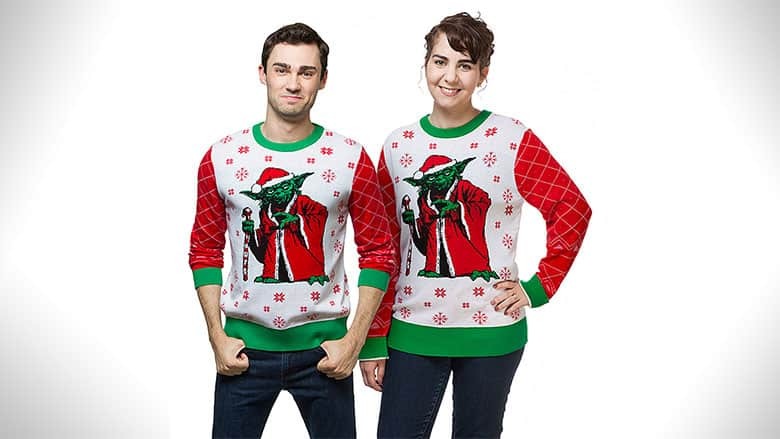 There isn’t a better way to prepare for the upcoming holiday celebrations right now than to find the perfect ugly sweater that you’ll soon be wearing to the yearly office party. Of course, these types of sweaters also make great nerdy gifts, so there are plenty of reasons to pick one up before the holiday seasons starts. 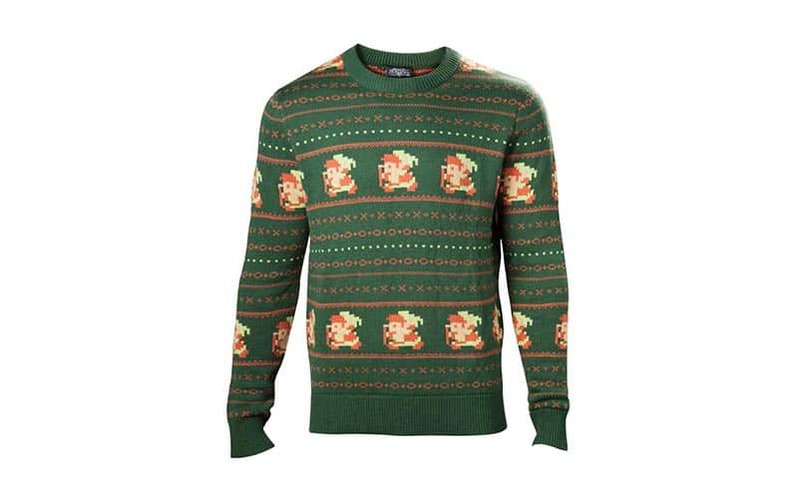 If you frequently use Zelda references in your everyday conversations, this Zelda: The Legend of Santa Christmas sweater is the best choice for you. Not only does it feature Link in his original 8-bit glory, but it has the typical green and red colorway that’s so common during the holiday season. It’s available in sizes Sm-2XL, and it’ll ship on November 10th from Merchoid later this year. So if you’re trying to get ready to rock around the Deku tree, check out this ugly Zelda sweater. 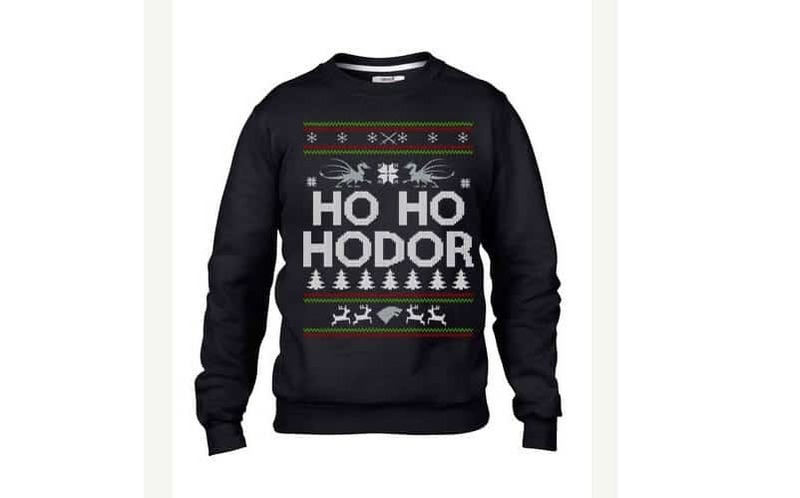 Check out some of the other nerdy Christmas things that Merchoid has at our Christmas hub. Every year, we see brand new Star Wars-themed holiday merchandise, and this year won’t be any different. This series is one of the major nerd fandoms with a very large fan base and has gained dedicated followers throughout the decades, featuring some of the most iconic characters and stories in science fiction. Here, Yoda is featured. Want more awesome holiday Star Wars stuff? Check out our roundup of the best Star Wars Christmas decorations. 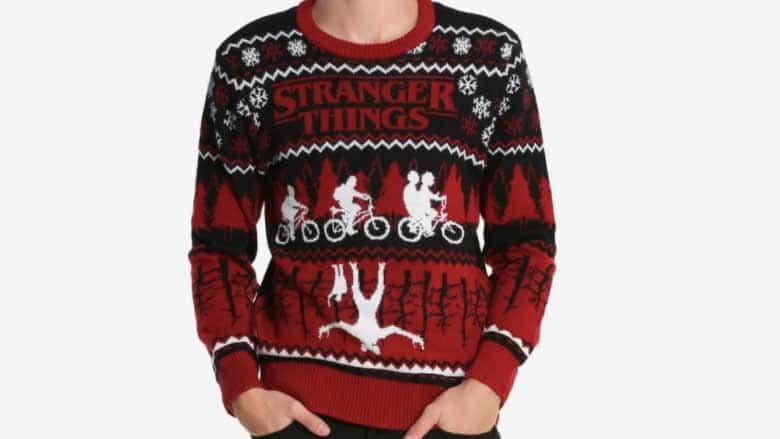 With Stranger Things Season 2 being such a huge hit this year, one of the most popular holiday jumpers will be this new one from Box Lunch. It has a demogorgan in the upside down, and the foursome on their bikes, both set to a black and red backdrop and some Christmasy snowflakes and whatnot. Big Bang Theory, whether people find it an accurate representation of nerd culture or not, certainly has a place in today’s pop culture, featuring a group of men who love comic books, video games, and science. Its popularity was at a all time high a few years ago, and has expanded its merchandise spectrum quite a bit. 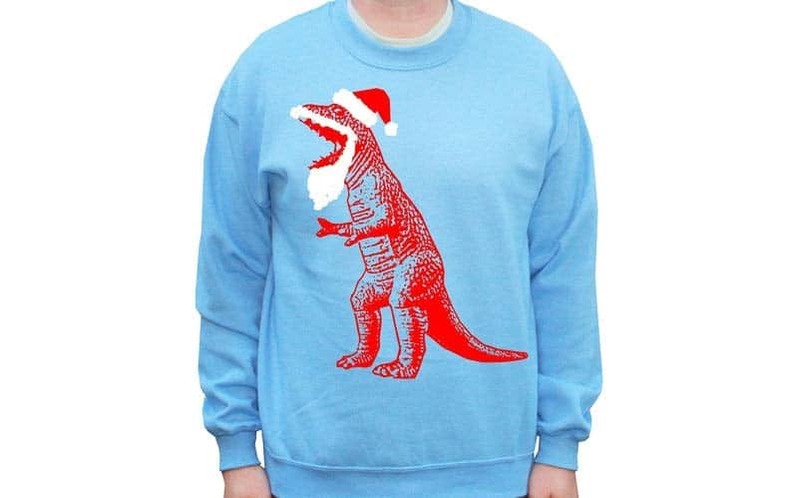 This Santa T-Rex sweater features the dinosaur shown in the theme song of the show, with a humorous santa beard and hat. Even if you heard Bazinga! 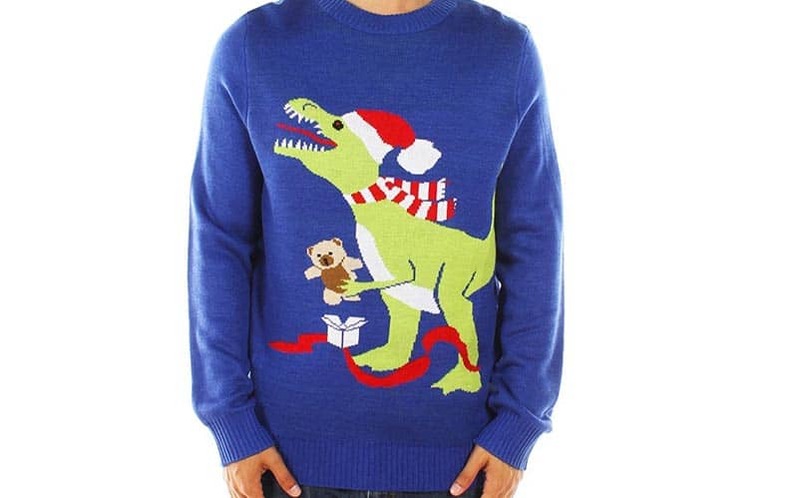 one too many times, this sweater is totally worth it, especially if you like dinosaurs. Harley Quinn’s popularity skyrocketed this year, thanks to Margot Robbie’s portrayal of the bat-toting villain in this year’s Suicide Squad. But before being portrayed by Robbie, back when she was voiced by Arleen Sorkin, Quinn had an entirely different vibe. This Harley Quinn Christmas sweater at Merchoid celebrates that vibe, showcasing Harley Quinn in her original red and black jester’s costume. 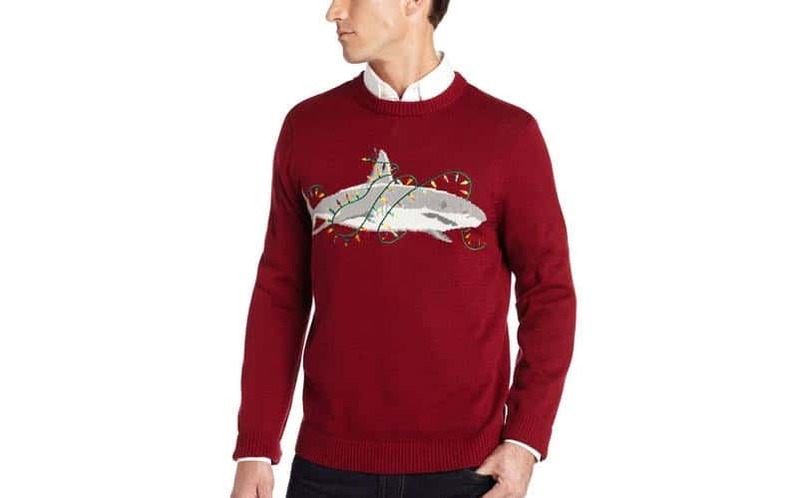 Following the theme of funny redesigns of dangerous animals and creatures, Sharky hits home as an interesting nerdy sweater option for this coming season. When looking at this, the first thing that can be thought of is Sharknado, the so-bad-it’s-good sci-fi movie about a tornado of sharks that is as ridiculous as it sounds. Make sure to keep an eye out for Sharknados on Christmas Eve! Based on one of the first Nintendo games ever made, Santa Kong is a Christmas twist on the original Donkey Kong game. 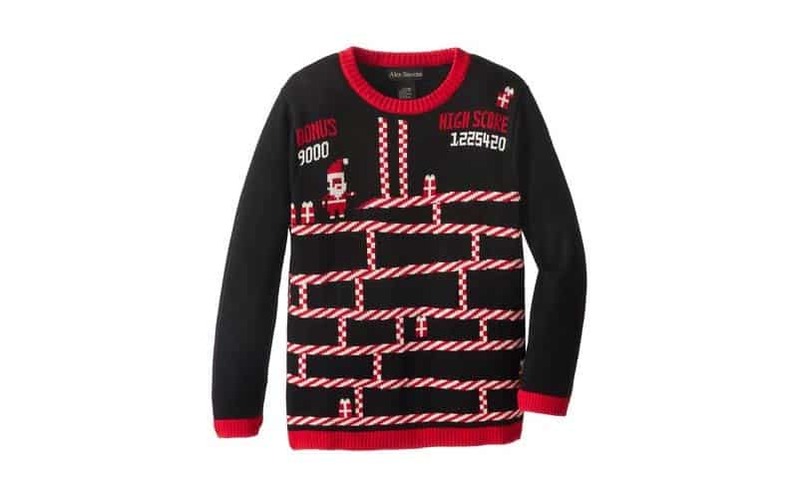 This sweater is a must have for any retro game fans who are looking for an amusing gamer design. The ladders are replaced with candy canes, and barrels have taken the place of santa outfits. It’s a very interesting take on the game without using the characters from the original title. If you have been in a Walmart or other store lately, you’ve probably seen the superhero cape shirts that can either be used as costumes or everyday wear. 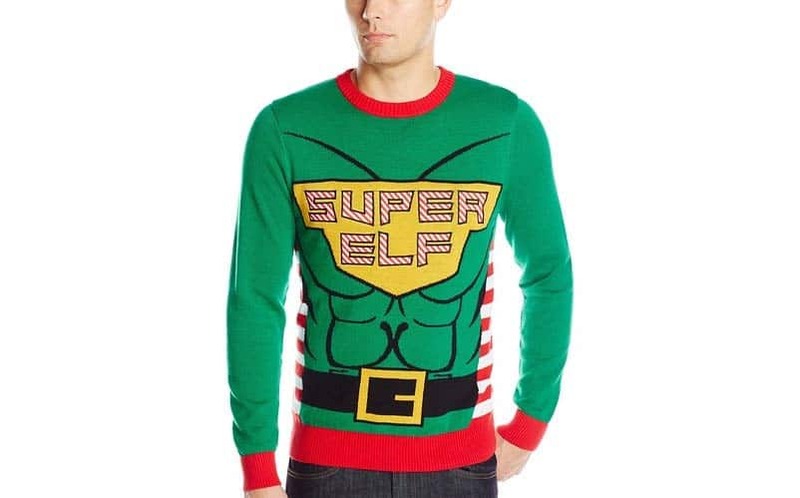 Super Elf is a humorous spin on these types of shirts, featuring a muscular elf with a red striped cape. 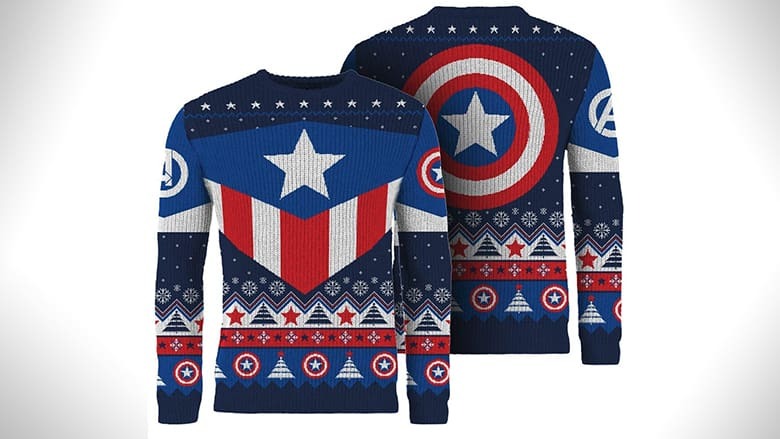 Although it doesn’t appear that the cape is actually attached on, this sweater is perfect for any fans of comics who want to be a Christmas themed superhero. 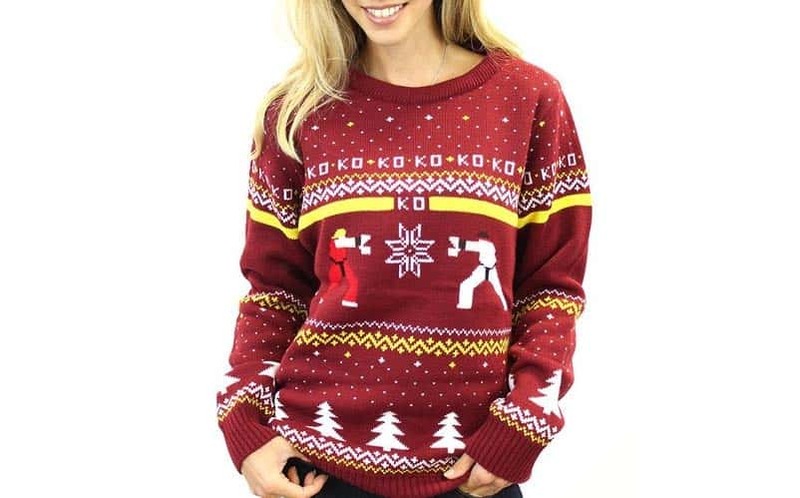 Street Fighter is one of the most popular and iconic fighting games, if not THE most well-known title in its genre, and it’s now appearing on a holiday sweater. This design features two characters, Ken and Ryu, duking it out under “KO’s” that play into the typical holiday cross stitch pattern. Possibly the most amazing part is the snowflake in between the two fighters, making it an amusing buy for any Street Fighter fan. Who doesn’t love unicorns or Santa? 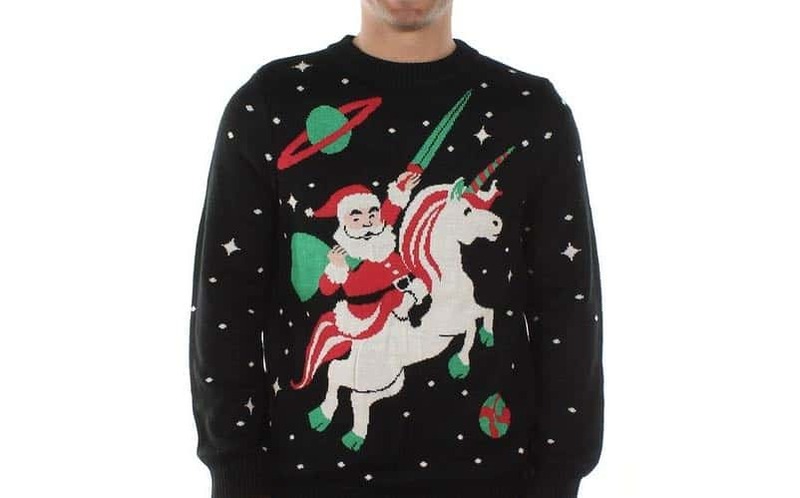 This unique piece is simply amazing, depicting a Santa in space riding a unicorn into the stars. 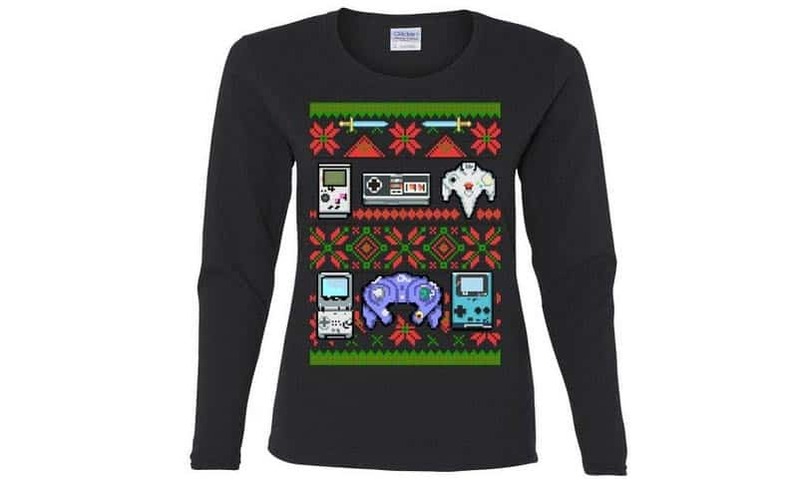 What more could one want in a nerdy Christmas sweater? It’s both ugly and ridiculous, which is the perfect combination when you’re looking at making people laugh at your holiday party this year. He-Man and the Masters of the Universe is a retro cartoon that still has a following today. The art on this particular sweater is very well-done, and it compliments the designs of the characters. 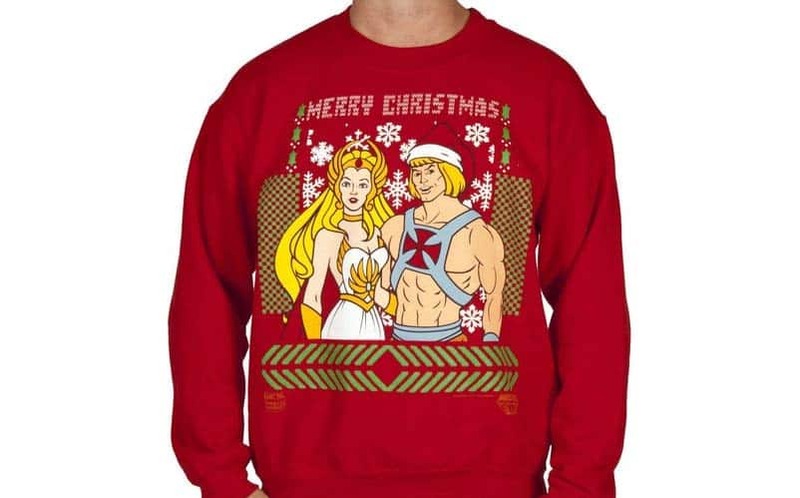 He-man’s Santa hat is a very nice touch, and She-ra looks gorgeous. Whether you are a fan of the series, or that HEYAYAYA video, this sweater is a great choice. 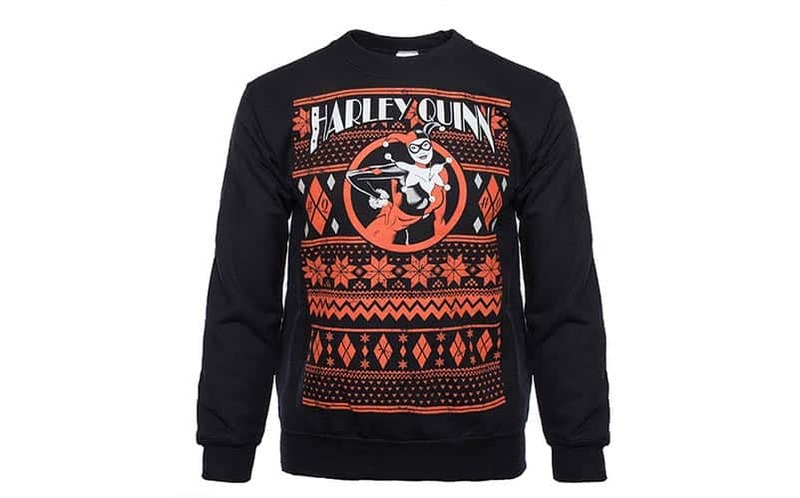 Fun.com has introduced a ton of new nerdy Christmas sweaters, ranging from Batman to Harley Quinn to Superman. 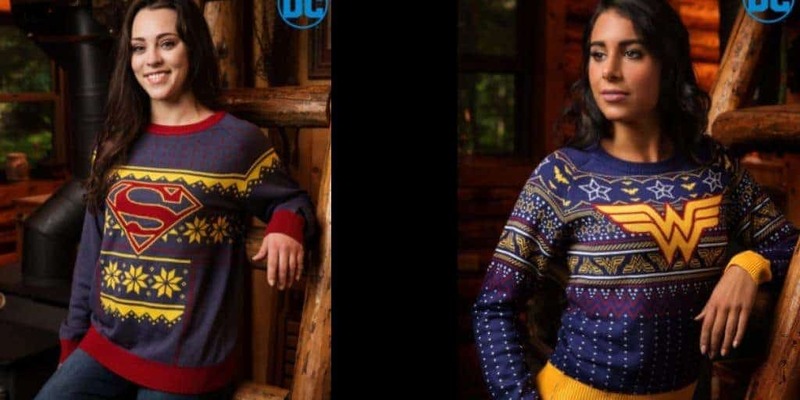 Our personal favorite is the Wonder Woman sweater shown in the picture above, sporting the classic Wonder Woman logo. The material is 100% acrylic so it’s super soft, and the classic blue and yellow colorway looks great. If you bleed Tardis blue, then this ugly Christmas sweater by ThinkGeek is the right choice for you. It screams nerd, as it’s modeled after Doctor Who fandom, as it includes things like the Tardis, sonic screwdrivers, Weeping Angels, and ‘Don’t Blink’. 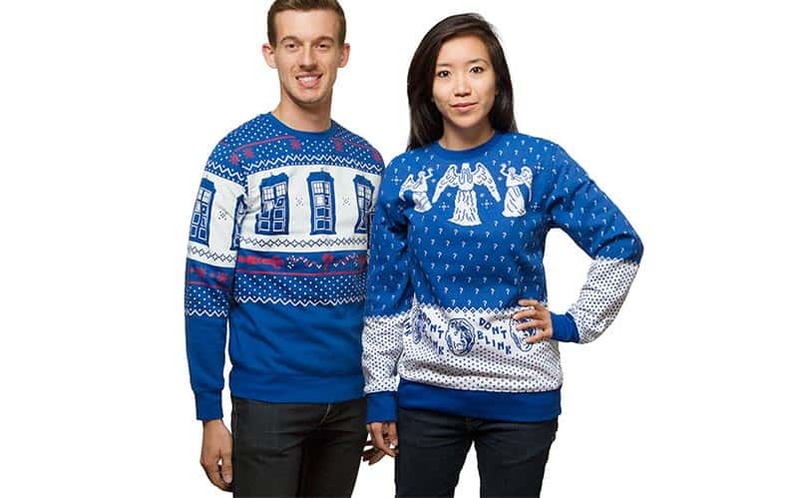 Of course, they’re Tardis blue, and both of these Doctor Who Christmas sweaters are exclusive to ThinkGeek. Although many Christmas sweaters feature holiday themed icons and characters such as snowmen, snowflakes, festive trees, and more, this design has some of the best consoles in gaming and the corresponding controllers. Just looking at this is definitely nostalgic, especially since many of us may have even received some of these retro consoles for Christmas presents. Imagine receiving every one of these for Christmas 2015. At least representing some gaming favorites this holiday will do. Star Wars and Christmas are frequently used together in the same sentence — for example, this Star Wars-themed Yoda Christmas Tree Topper or these R2D2 Star Wars Christmas Lights. This year, the two will be written next to each other many times, starting with the AT-AT Hoth Christmas Sweater. 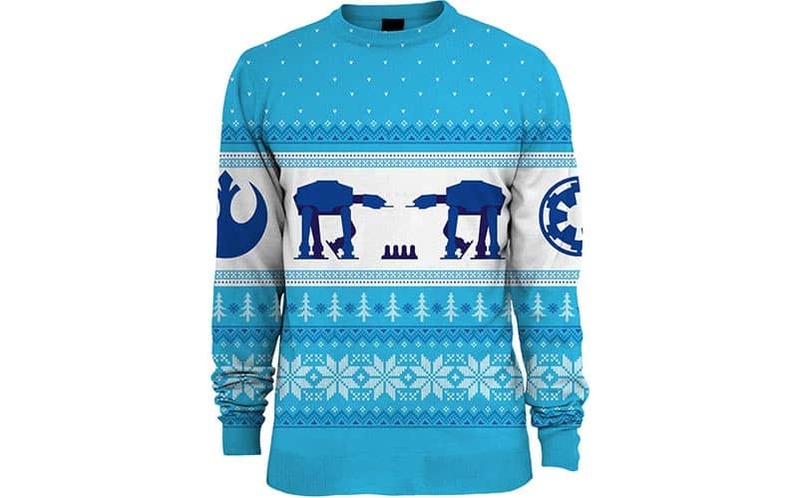 It’s fully knit, and it features not only holiday designs but also both the Imperial and Rebel logos, as well as two AT-ATs. Because it’s fully knit and uses 100% acrylic, it’s certain to keep you warm whether you’re in New York or fighting the arctic winds of Hoth. Jurassic Park has always been a hit, featuring the dinosaur theme park gone wrong plot that never gets old. The latest sequel, Jurassic World, premiered last summer and was a major hit, with a great cast of actors and cool special effects. Something that was really eerie about the movie was the similarities of tourism today, as many large companies always want something “bigger and better”. Especially with the hype surrounding the sequel as it heads into full production, Jurassic World is still at the front of our minds. 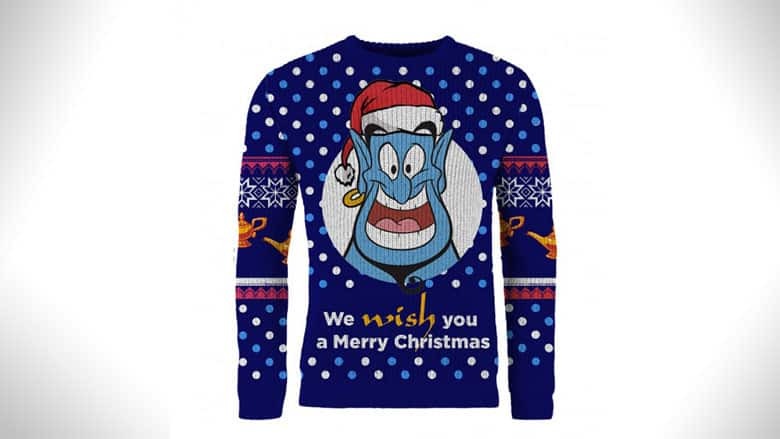 So why not advertise the theme park with this festive piece of merchandise? 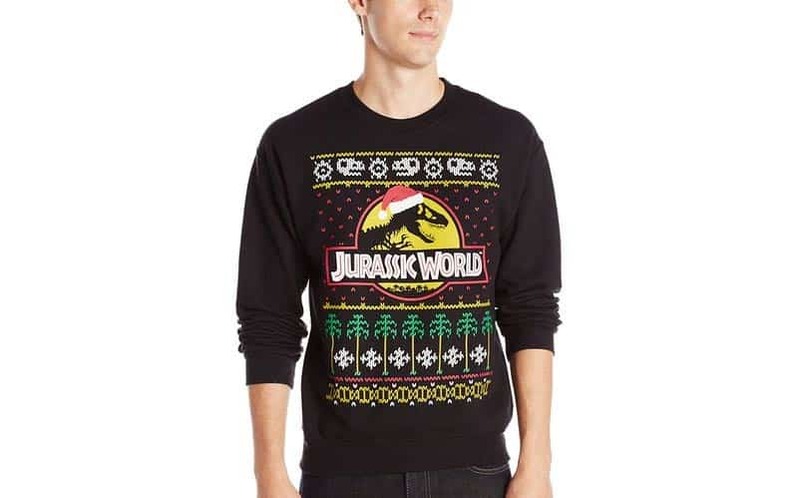 If the Big Bang Theory dinosaur design didn’t suffice, any Jurassic fan would enjoy representing their favorite theme park this holiday season. 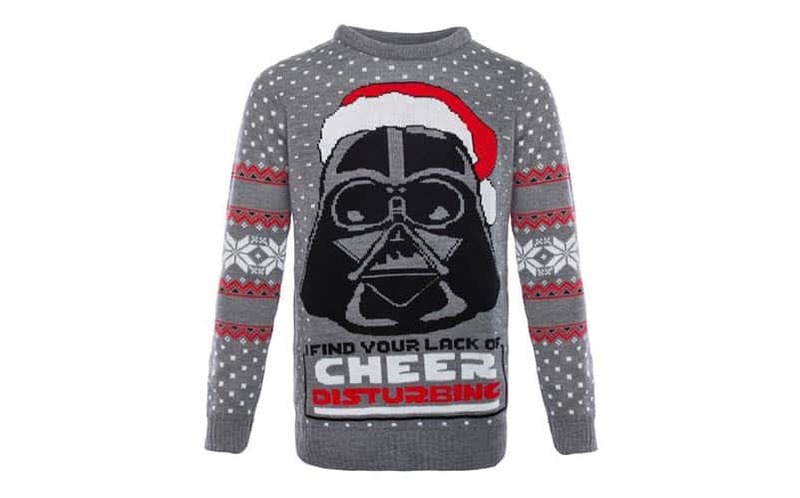 This officially-licensed Star Wars Christmas sweater features Darth Vader and text that reads, “I find your lack of cheer disturbing”. It’s also 100% acrylic and knitted, so it’ll keep you nice and warm this winter. Imagine a holiday party with Vader in attendance. I bet the Dark Side has epic holiday-themed drinks and cookies. Christmas carols with Vader? Count us in! I can’t think of anything nerdier than using a popular internet meme to celebrate Christmas. 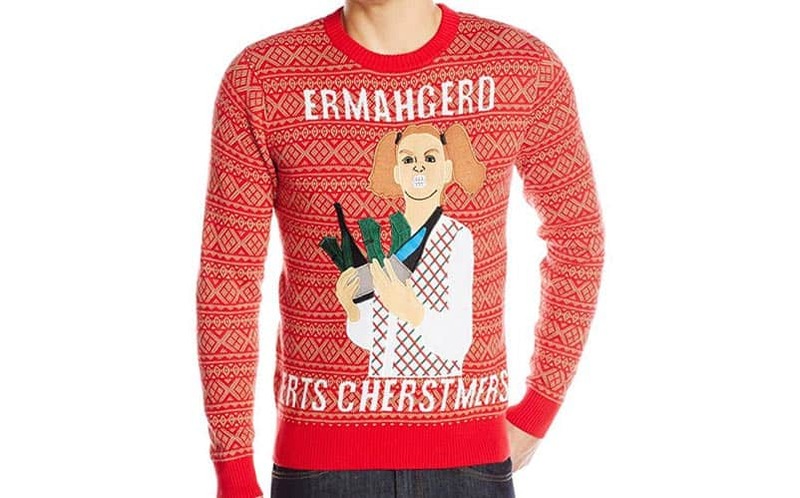 The classic Erhmahgerd image is sewn onto this incredibly ugly sweater design, which is predominately red and gold. Seriously, it doesn’t get any uglier than this, and if you’re going for something entirely ridiculous and funny, it’s a great option. 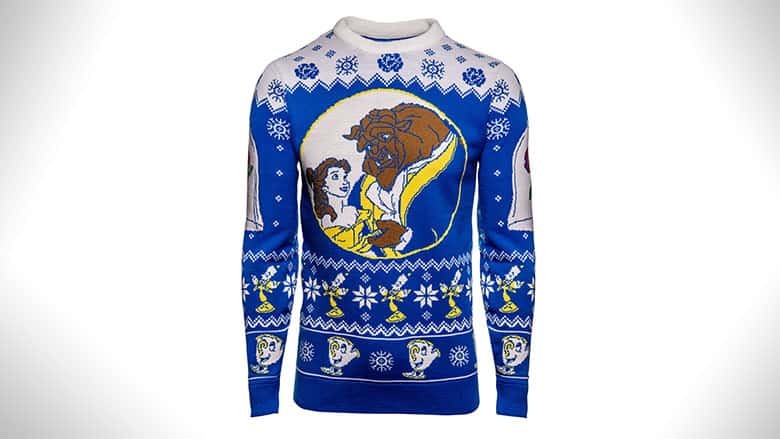 Of course, if you wear it to some uppity holiday party, people might pretend to not get it. But they get it; they know damn well that they’re familiar with the Erhmahgerd meme. Continuing on with the absolutely ridiculous theme, a T-Rex in a holiday scarf and Santa hat unwrapping a stuffed teddy bear is pure gold. This T-Rex looks like he was drawn in MS Paint, and that adds to its goofy appeal. Plus, wearing a T-Rex sweater to a party just says, “I’m here to F*ck sh*t up”. This year is a great year to show your PlayStation pride. Not did PlayStation see the release of some of their biggest and best titles yet — Uncharted 4 and Ratchet & Clank, for example — and the PS4 Slim and Neo Pro will be here soon. We’re not going to get into who is better between Microsoft and Sony, because that’s all a matter of opinion and we’re entirely neutral, but there’s no denying PlayStation’s awesomeness, especially when it’s being celebrated in ugly sweater form. 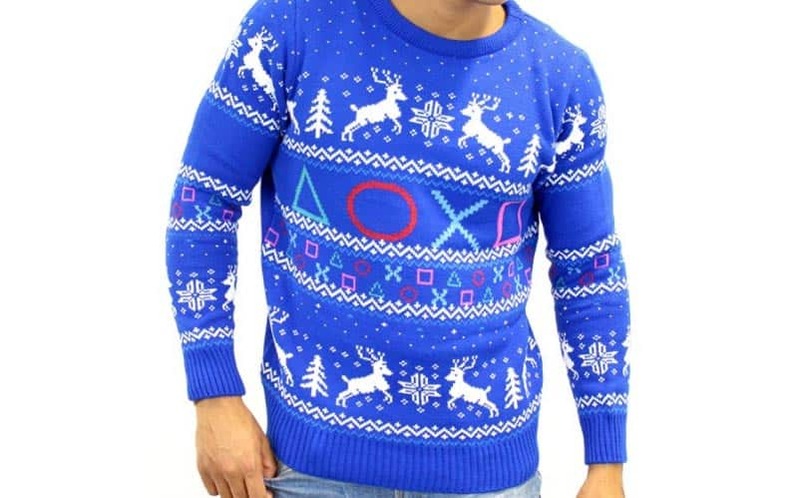 So if you’re anxiously awaiting Gravity Rush 2, waiting to delve deep into Nioh, or you firmly believe that Death Stranding will be the greatest video game ever made, check out the ugly PlayStation sweater. There’s not a better way than to spend the holiday months in a Vault-Tec approved sweater, especially when navigating the Wastes in Boston in the next couple of weeks with the release of the highly anticipated release of Fallout 4. Featuring a lovely knitted Vault Boy on the front, this sweater is perfect for the fans of the popular video game series. Cuddling up on the couch with this sweater while playing the latest installment for a month straight and ignoring all other forms of life, friends, and family sounds like a great plan for those who plan to explore every inch of the new world. We’re certainly going to add this one to our list of the 30 best nerd gifts. Of course, with Rick and Morty‘s popularity being at an all-time high, it shouldn’t be heard to believe that there are already many RIck and Morty ugly Christmas sweaters available this year. However, the best you’ll find is at Box Lunch. 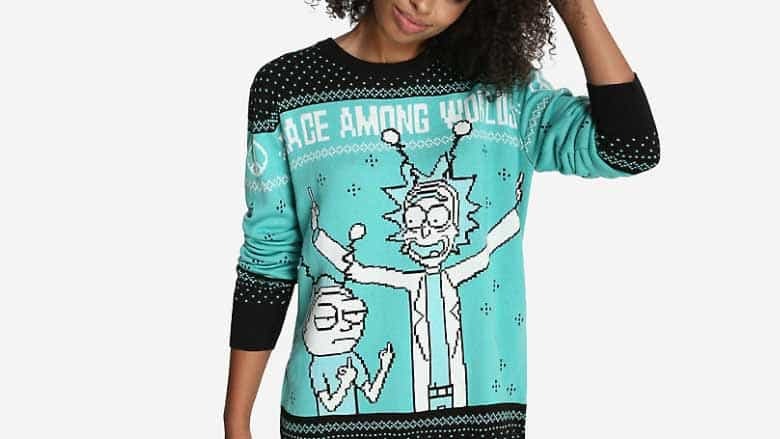 The sweater promotes Peace Among Worlds, with Morty giving the double middle finger. Wubba Lubba dub dub. 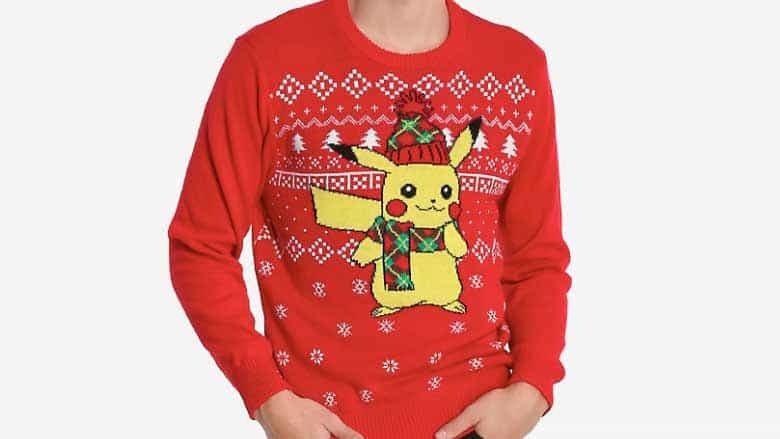 I’m actually quite surprised that there aren’t more Pokemon ugly sweaters out there, but Box Lunch comes to the rescue with this great-looking Pikachu Holiday Sweater. It’s also 100% acrylic like the rest of the outlet’s line of holiday sweaters, and it looks great. It has Pikachu in Christmas-themed garb set to a red and snowy backdrop. 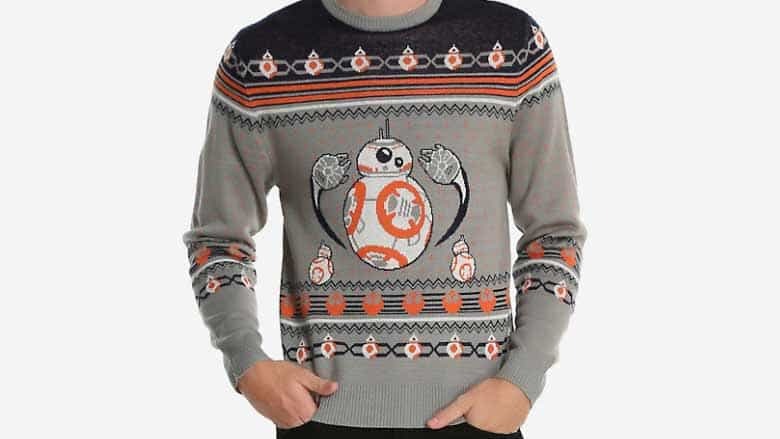 Another Star Wars Christmas sweater, this time from Box Lunch. It’s BB-8-themed, and it includes many BB-8s, Rebel logos, and Millennium Falcons. A great buy for 2017 especially, when you factor in that The Last Jedi releases in December. 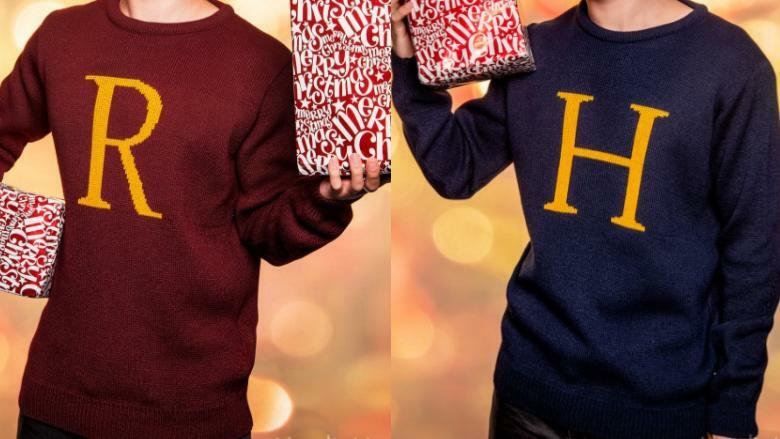 The official Harry Potter Christmas sweater is, well, magical. 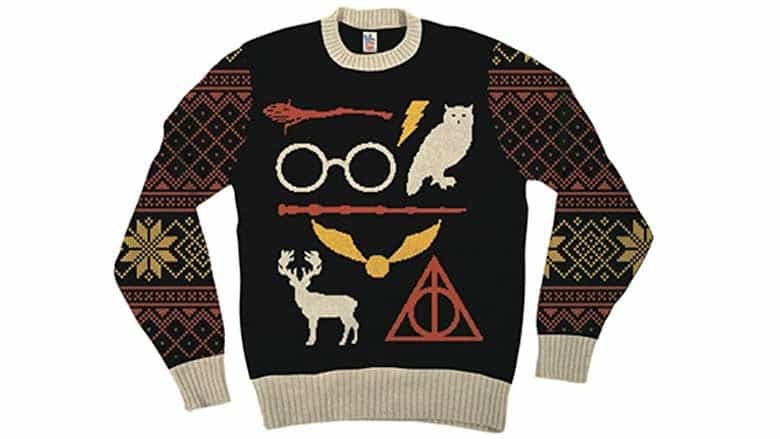 It’s brilliantly-designed, with Harry Potter glasses, lightning bolt, an owl, wand, a snitch, and more, all set with a Christmasy gold and red colorway, with a black background. Note that it runs small, so order a size up. See more Holiday sweaters here. Want more nerdy Christmas things? Follow us on Twitter in November and December, as we’ll be posting a plethora of new nerd-themed Christmas stuff there leading up to the holiday.